Neural or brain efficiency: Is it mental quickness or timing? Neural efficiency and mental quickness. Cognitive and intelligence researchers have long sought the “holy grail “of intelligence—an underlying core essence or mechanism that plays a role in most all intellectual and human performances. It is typically referred to as general intelligenceor simply, g. The general intelligence (g) concept is typically explained as being the result of neural efficiency. In simple terms, neural efficiency hypothesis states that the faster the brain’s synapses fire the more efficient and faster the transmission of information within the brain, both at the level of individual nerve synapses and eventually at the level of fine-tuned communication across the various brain networks. Neural efficiency is not a thing or structure of the brain but an indicator of how well the brain is working. For example, in most cars the engine parts are generally the same. There is no “horsepower” part, but the collective synchronization of the various parts of the engine produce different levels of horsepower for different engines or the same engine under different conditions. In simple terms, neural efficiency is analogous to mental efficiency or horsepower. The neural efficiency hypothesis has been the dominant theory for explaining differences in general intelligence. It is associated with one of the most prominent intelligence scholars for decades, Dr. Arthur Jensen. Most neural efficiency research has studied how quickly individuals can respond to very simple cognitive tasks which have taken a number of forms. 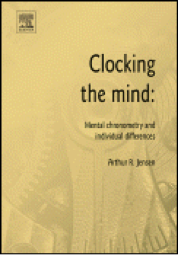 This literature is summarized in Jensen’s 2006 seminal book Clocking the Mind: Mental Chronometry and Individual Differences. Research has demonstrated that people differ in their reaction time(and other types of simple mental response “quickness”) tasks, and the speed is correlated with general intelligence (g) as measured by IQ tests. It is believed that those with quicker reaction time have more efficient firing of neurons—higher neural efficiency. The dominance of the reaction time-neural efficiency-general intelligence (g) theory in the field of intelligence cannot be understated. It is the dominant theoretical and empirically-based explanation for the neural or brain mechanisms the may explain human general intelligence. Neural efficiency and mental timing. It is against the dominant Jensen-based, reaction time-neural efficiency-general intelligence backdrop (hereafter referred to as the reaction time g position), that I was very excited when I discovered research by Dr. Rammsayerand colleagues that challenged the prevailing wisdom. In a 2007 article in the prestigious journal Intelligence, which is where Jensen and others have dominated in their presentation of the reaction time g position, Rammsayer and Brandler published the article “Performance on temporal information processing as an index of general intelligence.” This is listed as one of the key research articles (Temporal g-gen IQ) at the Brain Clockblog. 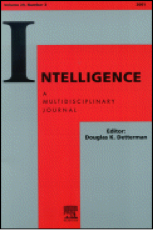 The subjects were administered a comprehensive intelligence battery of 15 different cognitive abilities (psychometric general intelligence or psychometric g), reaction time g measures that produced 8 different reaction time scores, and 8 different measures of different aspects of the internal master brain clock (temporal g). 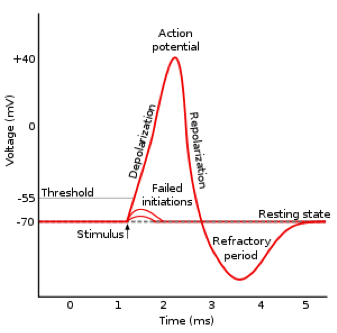 The important difference is that reaction time g focuses on quickness of responding while temporal g focuses on the perception, discrimination or reproduction of the timing of stimuli over time. The difference between reaction time g (quickness) and temporal g (timing) may sound elusive and can be understood by understanding the basic types of tasks used in each. In mental quickness (reaction time g) studies the typical task requires a person to gaze at a computer screen and watch for a certain image or flash to be displayed. The person is sitting with their primary finger resting on a button, and when they see the target stimulus they move their finger as quickly as possible and press another key. The time to do this is the reaction time. Temporal g tasks vary considerably, but in the case of a task like IM, an individual is not just sitting and waiting for a chance to react quickly, and then sitting back and waiting for the next time to react quickly again. Instead, the person is engaged in a constant attempt to stay on beat. In the IM task, the person is constantly focusing attention, responding steadily, and constantly receiving feedback, which is used to modify the rate of clapping (speeding up or slowing down slightly). The mental effort expended is much more demanding in a temporal g task like IM. An analogy would be running. When poised at the starting line for a race, a runner hears the start gun and attempts to start running as quickly as possible when the start gun discharges. This is akin to reaction time g—how fast can you react once you hear the target sound (the gun). Then he could stop and get poised again waiting for another start, upon which he would hear the gun again and again try to get started as quickly as possible. In contrast, once a race starts, runners need to maintain a constant focus on the synchrony of their breathing, arm and leg movements, and the rhythm of their pace, while exerting constant effort over a sustained period of time. The later is akin to temporal g, or IM. It is much more demanding in terms of sustained focus on coordinating the timing and synchronization of multiple physical and mental movements for more than just a brief quick moment. Thus, temporal g cognitive tasks like IM require much more constant and complex controlled attention and focus than simple reaction time g tasks. Without delving into statistical gymnastics, the analysis of this study found that the classic and revered reaction time g dimension correlated .34 with tested intelligence (psychometric g) while temporal g correlated .56 ! The higher the correlation numbers the stronger two things are related, with a correlation of 1.0 indicating one thing can perfectly predict another. These numbers are easier understood if they are converted to percent of relationship explained. When converted to percent figures, the temporal g dimension, which is reflecting brain clock timing and not reaction time, accounted for 31% of psychometric g while reaction time g accounted for 12 %. Temporal gwas 2.5 times more associated with measured psychometric intelligence (g) than classic reaction time g. For someone who has spent his career in the field of intelligence testing and research, this is a finding of major significance. Of course, this was only one study with 100 subjects and would be viewed with caution if the only study. But the systematic program of research by this group is impressive and deserves serious attention. I recently posted 16 referencesfrom this research group that collectively support the importance of the human brain clock and, more importantly, my scientific opinion that measures of brain clock timing (and not reaction time) are most likely better measures ofneural efficiency. Furthermore, my primary excitement stems from the connection between the successes of brain-clock based neurotechnologies (such as IM) and the temporal g or processing research. It is my hypothesis that these timing technologies are fine-tuning the resolution of the brain clock–which is a crucial mechanism for neural efficiency and, in turn, intellectual functioning. The focus on mental or brain timing, and not brain or mental quickness, is the key. 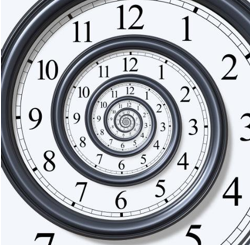 As mentioned in a prior post, brain timing is implicated in a wide variety of clinical disorderssuch as ADHD, autism, speech and language disorders (aphasia, apraxia), cerebral palsy, gate disorders, Huntington’s, schizophrenia, and Parkinson’s disease. In contrast, little research has linked mental quickness with clinical disorders and, more importantly, with interventions or treatments for clinical disorders. This post completes the description of my initial journey, which has recently taken me to using the IM-Home technology, which in turn has provided me IM-specific insights into possible cognitive explanations for the success of IM (click hereand here). Now you know “the rest of the story” of the initial phase of my journey to understand the human brain clock.